I first ran into Popsters at this year’s All Candy Expo. As I walked by I grabbed a sample and was blown away. 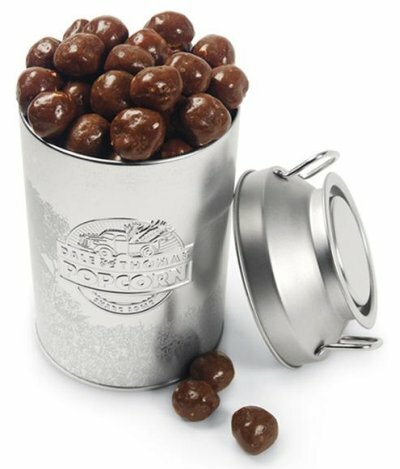 Popsters are mini caramel popcorn balls coated with milk chocolate, dark chocolate, or a peanut butter. The mini popcorn balls range from roughly the size of a whopper to the size of a jellybean. They aren’t skimpy with the coating and the ratio of coating to popcorn is just right. The popcorn adds a nice flavor and crunch to the Popsters. Milk Chocolate – Wow these things are like little balls of heaven. The chocolate is really tasty and the combination with the popcorn and its coating is just superb. I am instantly addicted to these things. Dark Chocolate – These were much better than I expected. I’m not a huge fan of dark chocolate, but this dark chocolate lacked the bitterness most dark chocolate has and was very flavorful and rich. YUM! Peanut Butter – I wasn’t sure what to expect with the peanut butter, but they turned out to be great too. These tan balls of goodness have an unmistakable peanut butter taste and when combined with the sweetness and crunchiness of the popcorn, is fabulous, if not just a tad too sweet. It reminds me of eating Peanut Butter Cap’N Crunch cereal (which is a good thing). For you true Candy Addicts wondering if I tried the peanut butter Popsters with both types of chocolate Popsters – I did and the the mix of the two is wonderful. We can only hope their next flavor will be peanut butter and chocolate mixed. I can’t say enough good things about Dale and Thomas Popsters. The quality is phenomenal and all three flavors taste amazingly good. Do not buy these if you are on a diet or have little self-control. Once you open a bag it’s hard not to polish off the whole thing in one sitting. The Dale and Thomas Popsters are worthy or our best of the best award, the Candy Addict Awesomely Addictive Candy Award. The Popster will be available in 6 oz. bags through many retailers throughout the country very soon. by the way, that daleandthomaspopcorn website link doesnt work. Seems to be working for me!